"Crash avoidance technology – like front crash prevention – is possibly more important than seatbelts and airbags," said David Zuby, chief research officer at the U.S. Insurance Institute for Highway Safety (IIHS). New safety systems, like front crash prevention, often go by different and confusing names. System capabilities vary from one car to the next, and they're not all created equal. So it falls to drivers to understand this technology and pick a vehicle with a safety system that's going to make the biggest difference. "For the last 20 or 30 years, maybe even going back further, most of the focus on making vehicles safer was on protection," said Zuby in a telephone interview. "That's why we've got seatbelts and airbags. All that stuff is about reducing the risk of being injured, given that crashes are going to occur ... It's really computer technology and sensing technology that's going to help avoid crashes in the first place." In other words, the focus is shifting from protecting people in a crash to preventing that crash in the first place. The IIHS has a useful online database of available crash avoidance features by make and model, but note it's a U.S. database; features on Canadian cars will sometimes differ. The most important of these crash avoidance technologies is electronic stability control, or ESC. Transport Canada made it mandatory on all new vehicles produced since Sept. 1, 2011. ESC does a good job of preventing cars from sliding out of control, even on snow, by applying the brakes momentarily to individual wheels and/or reducing engine power. "[With ESC] we see close to a 50 per cent reduction in the likelihood that somebody will be killed in a run-off-road crash or roll-over crash," said Zuby. Transport Canada estimated that, had ESC been made standard in 2006, it could have prevented 225 deaths and 755 serious injuries in that year alone. Even compared to other recent car safety technologies, ESC is a major breakthrough. For example, the IIHS found little evidence that anti-lock brakes alone have reduced the number of real-world crashes. Rear-end crashes are the most common type of collision reported to police in North America, Zuby said. Collision avoidance systems prevent about 50 per cent of these accidents, the IIHS found. Even in cases where AEB failed to prevent a collision, it reduced the severity enough to cut the number of injuries in half. Forward collision warning watches the road ahead – with cameras and/or radar – looking for vehicles, pedestrians, or even large animals. If the system detects a potential collision, it warns the driver with lights and alarms to take action. In some cases, the system will prime the brakes and/or steering, readying the vehicle for evasive manoeuvres. The warning alone reduces rear-end crashes by 27 per cent, according to the IIHS. Automatic emergency braking takes it one step further. If the driver fails to heed all warnings, the car will automatically brake in an attempt to avoid a collision. Some newer systems – as on next year's Lexus LS – will even try to steer around an obstacle if there's space to do so while keeping the car in its own lane. AEB is not standard equipment on most vehicles. It was introduced as a feature on luxury cars, but can now be found as an option on most mainstream vehicles. Most auto makers who sell cars in North America have signed onto a voluntary agreement to make AEB standard on all-new passenger vehicles by Sept. 1, 2022. Again, these technologies can go by different names, so pay attention to what you're actually getting. 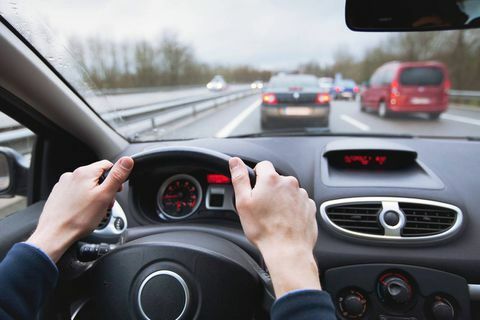 Lane departure warning will only alert the driver – with beeps or dashboard lights or even by vibrating the steering wheel – if the car is drifting out of its lane. Lane departure prevention or assist will try to steer a vehicle back into its lane. The quality and capability of these systems varies wildly from car to car. Some do a good job of keeping a vehicle in the middle of its lane, while others tend to make a vehicle swerve from side to side in its lane. A test-drive is a must. Of course, these systems only work when turned on. The IIHS found that lane departure warning systems that beeped were frequently turned off by owners. "Lane departure warning has not brought down insurance claim rates," the IIHS found, "but has reduced rates of single-vehicle, sideswipe, and head-on crashes reported to the police." Lane departure warning and/or prevention is available as a standard or optional feature on nearly all new vehicles. If you find yourself constantly surprised that there's a vehicle next to you when changing lanes, blind spot detection/monitoring will help. Using radar, your car can "see" vehicles you might not be able to using the mirrors alone. If there's a vehicle sitting in your blind spot, a monitoring system will alert you with a warning light inside or near your side mirrors. If you try to change lanes while there's a vehicle in your blind spot, some systems will vibrate the steering wheel in an effort to get you to pause and look over your shoulder. "Blind spot detection has been shown to reduce lane-change crashes by 14 per cent," according to an IIHS study. It's more than worthwhile and, if it's an optional feature on a vehicle, usually not as expensive as other collision avoidance systems like automatic emergency braking. These systems can alert the driver – when backing out of a parking space or crossing an intersection, for example – if there's a vehicle approaching from the side. Some systems only work when backing up, while others are specifically for intersections. Some will automatically brake, while others will only warn the driver to take action. Again, the capabilities of these systems vary widely, so when ticking an option sheet, be clear about what you're actually getting. Unlike lane departure warning/assist systems, the IIHS found that nearly 100 per cent of drivers who have cars with cross-traffic alerts and blind-spot detection leave these systems turned on. They're generally not intrusive or annoying and can prevent the occasional embarrassing parking lot fender-bender. If you make cars safer, some drivers will take that as an excuse – consciously or not – to drive more dangerously. "We've done some field tests that involve giving cars to regular people for a period of time," said Zuby. "Some of those studies show that when a car has distance alert or forward collision warning, some drivers will follow more closely. It's not a really strong effect, but there are even some people who will admit to doing it." "Blind spot information is another one," he said. "People will admit to not looking at their rear-view mirror if their car has blind spot monitoring." While collision avoidance technology has so far proved capable of dramatically reducing the number and severity of crashes, it is far from perfect. Even state-of-the-art automatic emergency braking or lane-keeping systems are intended as a backup, a last line of defence for when a driver makes a mistake. Can modifying a car affect its warranty?